OMEGA™ FPUD400 Series drum pumps can empty a wide variety of containers in various applications. The pump tube and motor are supplied separately in modular construction for maximum flexibility. Available motor types are 110 or 220 Vac powered, continuous duty, totally-enclosed, fan-cooled (TEFC) motors; and air driven motors. All Vac powered units include 12-ft, three-wire cord, built-in ON/OFF switch; and circuit breaker with manual reset. The FPUD411 includes a wall plug. The FPUD431 air motor has a 1/4" female NPT fitting for hooking up to a customer-supplied air hose, and includes a flow-regulating valve and muffler. 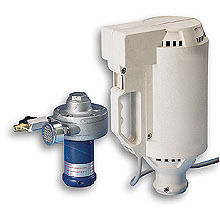 An optional air lubricator/filter assembly is also available when your air source is not filtered and lubricated. When pumping flammable or combustible materials, or in explosive environments, use an air motor with a stainless steel tube and the FPUD34-SK static protection kit to avoid sparks produced by static electricity discharge. The FPUD4-SNT40 sanitary pump tube features a polished 316SS tube and shaft, a graphite-filled PTFE seal, and pure PTFE internals. It has an ACME sanitary nut connection so the tube can be easily be removed for cleaning. FPUD4 series pump tubes are rated up to 150°F (SS and sanitary tubes), or 180°F (CPVC tubes), 2,000 cps viscosity (2000 cps air motor; 400 cps electric motor) and 1.8 specific gravity. All tube assemblies have graphite-PTFE seals with PTFE internals, and feature 1" I.D. hose connection on the outlet. 참고: Comes complete with operator's manual. AC pump motors include integral power cords. Power cords with 115VAC models include grounded wall plug.